Hinter Jack Ü stehen Skrillex und Diplo, hinter Justin Bieber ein Idiot - schon die Kiesza Zusammenarbeit fand ich nervig - hier's ist sanfter, aber nicht unbedingt besser. The interesting sounds prevent this from going below average. Could have been much worse but thankfully not. Gesanglich in gewohnter Bieber-Manier weichgespült daherkommender Titel, der in den Parts ohne Vocals immerhin durch ungewöhnliche Sounds überzeugt. Wirkt mir insgesamt aber nicht durchdacht genug, so recht vermag dieser Mischmasch nicht zu überzeugen. Why Justin Bieber? 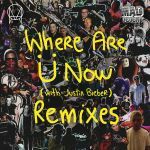 :P<br><br>A weaker, but still good track from Jack Ü. ▒ Eigenlijk helemaal géén verkeerde plaat van de heren, voorjaar 2015 ☺!!! A boring vocal from Bieber and boring music from whoever make this all around worthless, but at least not unlistenably obnoxious. Focus on the positives! Even had ik de stille hoop dat het nog wat zou wezen, maar helaas. Het stelt weinig voor. Het plaatje begint met een saai intro gezongen door Justin Bieber en barst uit in een potpourri (mengelmoes, ratjetoe, allegaartje) van uiterst irritante geluiden die wat mij betreft niet eens bij elkaar horen. Opzouten hiermee. Les couplets (donc la partie de Justin) me conviennent tout à fait. Wat RV zegt. Soort jungle met Bieber als aap.<br><br>Edit: Toch maar wat sterren erbij. Wat een groeier is dit.<br><br>Edit2: Deze plaat markeerde toch de omslag van Bieber als kindster naar Bieber als volwassen en gerespecteerde zanger. Wat een fenomeen en wat een vette plaat is dit nog steeds. A pretty interesting sound that didn't strike me as being too good on the first listen.<br><br>I'm not sure what direction repeated hearings will take this song, but I'm thinking I'll grow to like it more. Un titre assez réussi né de l'association Skrillex/Diplo. Je pense à une version plus club de "Don't Judge Me" de Chris Brown. Ziemlich üble Mucke - und das liegt noch nicht mal an Justin Bieber. Different sound but I don't find anything particularly interesting about it. Also it snnoys me that it is neither good to run to nor dance to. Frustrating. Ja genau, wo war er denn, der Bub? Vreselijk! Jammer ook van Skrillex en Diplo door zo hun naam te grabbel te gooien. ...dito tgebele!...<br>@ Fabi - wie recht du hast - ich stimme dir voll und ganz zu! Hier dürfen die lange verschollenen Buchstaben WTF mal wieder reaktiviert werden. Bieber hin oder her, das Getröte ist ja unerträglich. I like this track and it's quite interesting. UK#3 and Ireland#9. Ein Track, den es bestimmt schon in dieser Richtung gab - und noch geben wird. Großartig produziert. Gehört für mich zu den diesjährigen Highlights. Nicht ganz so mies wie erwartet, gibt schlimmeres auf Bravo Hits und Co. I've never really liked Justin Bieber but I have become more apathetic in that regard since about 2013. After all there are a few songs of his I could enjoy and there was a noticeable improvement in his output over time. This for me was interesting because it marked the first time I felt like I actively cared about one of his songs. Granted working with Diplo and Skrillex was always going to appeal to me more than the teen pop he was making before. But listening to this I didn't even care at all, and why should I when he could easily have been some unknown artist pulled from somewhere to provide the vocals.<br><br>I don't find this anywhere near as satisfying as the other two Jack Ü tracks I've heard, let alone many other tracks from Skrillex or Diplo but it's solid. I did get sick of it but hearing it less in the last few months has certainly helped. I do fall for the chill vibes present here and Bieber's vocal works well with that. It's not perfect but it works for what it is. The production is solid and interesting enough but the drop really could've been something better. All I remember from it is those weird sounds that cover it. Not only that but it does seem to go on for too long. The track in general suffers from this I feel, parts of it really drag on. A bit too bland for its own good I suppose.<br><br>I do like this, but it's a little sad that it has become one of the biggest hits with this sort of sound because it's not as good as most of its contemporaries. If anything it really feels like a stepping stone to something greater for Justin Bieber, which even before "What Do You Mean?" surfaced I had a feeling would happen. Also I did hear a remix of this in the club over the weekend and it was far more interesting. I have no idea what that remix was called or if it was even official but the general feel I got was that it helped fill in the gaps where it dragged out. Which was nice. Nichts für mich. Besonders die Produktion klingt dermaßen dünn und nicht dynamisch. Die von Werner angesprochene Kreissäge im Hintergrund ist schlicht furchtbar. Der Rest ist hörbar, Justin Bieber fällt weder auf noch ab, insgesamt eine knappe 3 - war zum Glück kein Hit hierzulande. Diese für mich wild zusammengewürfelten Musikfetzen gefallen mir gar nicht. Awesome track. Bieber's contribution is suprising but it works big time. The song that bought Justin Bieber a huge comeback into the charts. And the song even found love among his haters. Dit was een enorme hit in Nederland. Zelf vind ik het een degelijk plaatje, meer ook niet..